US Secretary of State Mike Pompeo’s provocative speech on 22 July that attacked Iran’s leadership and policies, and prompted a brief but hostile exchange between President Hassan Rouhani and President Donald Trump about the threat of war, has provided an opportunity for Rouhani to seize the initiative and sell himself and the Iranian government, domestically and internationally, as genuinely moderate and committed to reformist policies. If Rouhani grasps the challenge, two credibility tests will apply: are those policies truly reformist and, if so, will he have the support of Supreme Leader Ayatollah Ali Khamenei and the military to implement them? Pompeo’s speech was wide-ranging and blunt. He painted the expected canvas—accusing Iran’s theocratic and military leadership of mafia-like corruption, of sponsoring terrorism regionally and in Europe, of regional destabilisation, and of seeking to destroy Israel—and implied that Iran wasn’t genuinely committed to the nuclear deal. He also accused the leadership of human rights abuses (citing multiple political detainees as evidence) and suppression of religious minorities. Pompeo was heavily dismissive of Rouhani and the moderates, describing them as ‘violent Islamic revolutionaries with an anti-America, anti-West agenda’ and being neither true moderates nor statesmen. He didn’t differentiate between the moderates and hardliners, or acknowledge that the supreme leader, not Rouhani, commands Iran’s armed forces and security services. He effectively challenged the moderates, including Rouhani, to prove they have the will and capability to implement change. 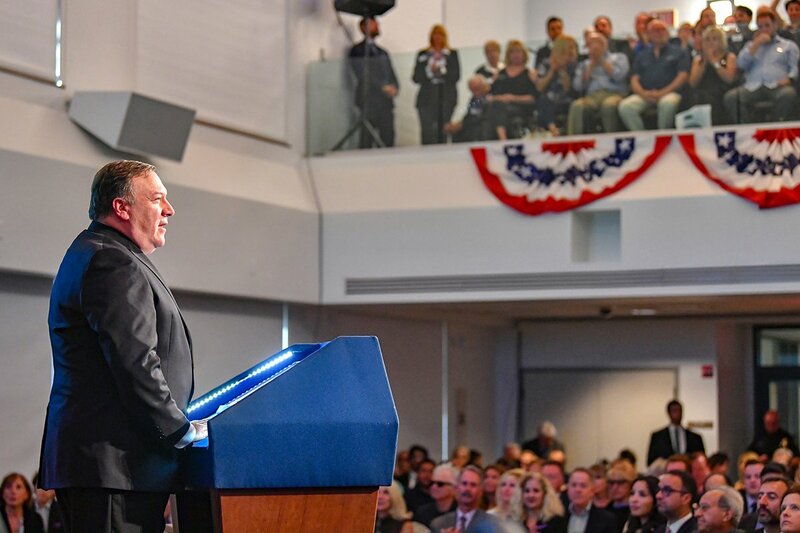 Pompeo stopped short of calling for the Iranian people to overthrow the regime. 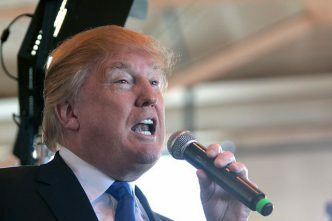 However, he made it clear that the US would pursue sanctions to break the Iranian economy and support dissidence through social media and other information-outreach operations to facilitate regime change—until or unless there were ‘tangible, demonstrated, and sustained shifts in Tehran’s policies’. Pompeo left little doubt that those shifts are part of a holistic sanctions-related package, encompassing what he and Trump have identified as Iran’s other malign and destabilising activities. 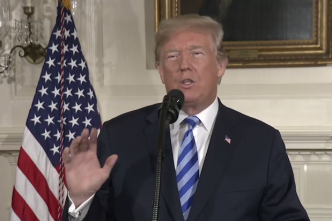 Outwardly at least, there was no sign in this all-or-nothing deal that the US would separately accommodate any Iranian agreement to rectify the flaws that Trump identified in the Joint Comprehensive Plan of Action. 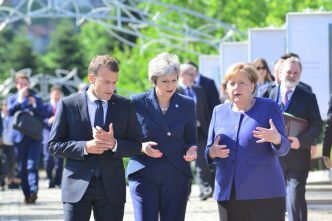 If so, this cuts across the efforts of the European JCPOA signatories to separately negotiate on Iran’s nuclear- and missile-related activities, and other undefined ‘de-stabilising actions’ referred to in the UK, France and Germany’s joint declaration supporting the JCPOA in October 2017. 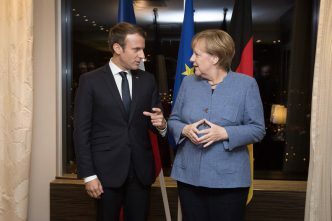 Initial responses indicate that the Europeans are angry and frustrated at the US’s disregard for their interests and efforts, and uncertain about what sanctions relief may flow from any change in Tehran’s policies. All JCPOA signatories, and others, are also disquieted by Trump’s extraordinary confidence that if he does break Iran’s economy and precipitate widespread dissidence (or worse), he can shape a new ‘acceptable’ Iranian regime out of the resultant chaos. Few would share such confidence. When and how Iran and the other parties address these challenges rests largely with Iran. There are two practical options. The first is for Iran to simply stare down the challenges and hope to ride them out, relying on past resilience and self-sustainability, and the expectation that other countries and corporations will defy US sanctions and the threat of US trade and financial retaliation. That option entails major risks. While countries such as China, Russia and possibly India may challenge US sanctions, Iran’s European and other major trade and investment partners, including Japan and South Korea, are less likely to do so. Europe’s commitment also isn’t a given. JCPOA foreign ministers and the EU high representative appeared to be frustrated and impatient about progress after their 6 July meeting with Iranian Foreign Minister Javad Zarif in Vienna. The Europeans were concerned that Iran was holding out for trade and investment guarantees they couldn’t give and were doubtful that any JCPOA-related resolution could be reached, even by the November deadline. The second, preferred option—assuming that Rouhani can negotiate Khamenei’s support—is for Iran to seize the challenges as an opportunity, act boldly and commit to forging a resolution that is a win for all interested parties, both domestic and international. The urgency to show a credible commitment is dictated by the November deadline, even if it takes longer to demonstrate implementation. 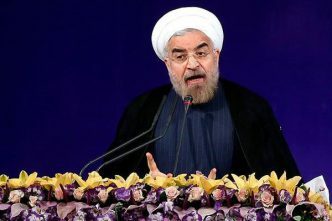 Internationally, Rouhani should reaffirm Iran’s commitments to being a constructive contributor to regional peace and security, including recognition and respect for political, ethnic and religious differences, especially among minorities. He must also show that Iran is committed to defeating common terrorist threats from such organisations as IS and al-Qaeda and resolving grievances that generate terrorism. On the nuclear front, Rouhani must restate Iran’s commitment to never acquire nuclear weapons, irrespective of the JCPOA’s sunset clauses, and to comply with all IAEA compliance-verification protocols. Iran also needs to confirm that it won’t develop nuclear-capable ballistic missiles, and that all missiles will be defensive and limited in range consistent with assessed potential regional threats. Rouhani should confirm Iran’s desire for a positive relationship with the US and all other countries based on mutual respect, including recognising Israel’s sovereignty and its UN-recognised borders. Iran should be ready to work with Israel and other states to resolve security threats and border and occupation disputes, and support freedom of navigation in its adjacent waters. Domestically, Rouhani must reaffirm his commitment to addressing corruption, implementing social reforms, and reviewing the status of prisoners and releasing those unjustly detained. However Rouhani packages this commitment, it should be presented as an enduring Iranian policy initiative; be short, explicit and positive; and offer reassurances to both international and domestic audiences. It shouldn’t rehash accusations and counteraccusations that have already been fully aired. It’s time to offer solutions. Ian Dudgeon is a presidential associate of the Australian Institute of International Affairs and past president of the AIIA ACT branch. Image courtesy of Secretary Pompeo on Twitter.